Commercial and production bakeries operate long hours and require a strict cleaning regiment to maintain proper food safety standards. Wet floors, hot rack ovens, and heavy equipment cause traditional floors to disintegrate. 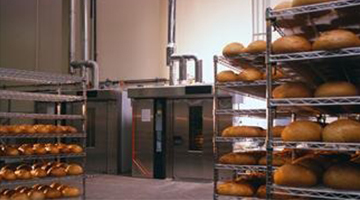 Florock offers a full range of commercial bakery flooring options including waterproof, antimicrobial and slip-resistant flooring systems to withstand a bakery’s daily operations, while supplying outstanding lifecycle value. A commercial bakery has a variety of areas with their own unique flooring requirements. From proofing rooms to oven areas, from dry storage areas to automated production and packaging lines, each space requires especially formulated floor coatings to meet the demands of a busy commercial bakery. Our durable resin flooring systems are designed to help support sanitation requirements throughout. Florock’s FloroCrete Urethane Mortar can withstand the higher temperatures found around commercial ovens, as well as the high pressure, high temp detergent cleaning commonly employed. Our broad range of slip-resistant epoxy floor coatings allow for the perfect level of slip-resistance needed in areas where sugar, flour, spices and other dry ingredients create slippery surfaces. Large bulk storage of many powdered dry ingredients can produce combustible dust, creating an explosion hazard. As part of a facility-wide program, Florock’s Conductive Flooring can safely dissipates static electricity out of the room, helping to create a safer environment. Water, shortening, butter and oils come together in wet processing areas, creating especially hazardous conditions requiring superior slip-resistant finishes. Additionally, systems like FloroCrete Cementitious Urethane have high tolerance to moisture and exceptional chemical and acid resistance, combating the damage from vegetable oils, dairy products, salts and sodas. Walk in cooler flooring and freezer flooring must undergo repeated changes in temperature. These areas require thermal-shock resistant finishes. Our range of commercial floor coatings can be installed at temperatures below 0 oF and can cure in as little as 2 hours. 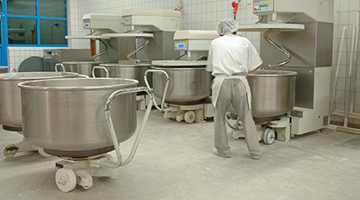 A commercial or production bakery requires high-performing resinous floor coatings that can withstand the harsh conditions of day-to-day operations. Our high performance floor coatings are formulated to support the sanitation and decontamination protocols of any commercial bakery. Our impervious flooring systems are seamless to prevent buildup of bacteria in crevices or cracks. We also offer the epoxy wall systems often required by government inspectors. For areas with public access, Florock’s full line of polymer flooring systems allows bakery facility managers to customize the look of their floors with colored quartz or chips Select beautiful flooring that’s as enticing as the goods you bake! Contact a flooring specialist for a free site visit.